The ISS-Phyto represents a new size spectra sensitivity-based approach to ecological status assessment in transitional waters. This index integrates simple size structure metrics with phytoplankton biomass, taxonomic richness thresholds and models of phytoplankton size class sensitivity to anthropogenic disturbance. 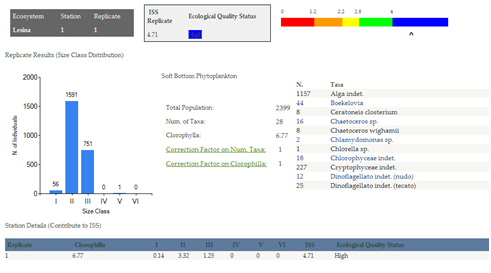 ISS-Phyto has practical advantages that promote its widespread use as a monitoring tool in transitional waters: body-size is indeed simple to measure, does not require great expertise to be measured because it is independent of taxonomical classification, and can be easily inter-calibrated among different laboratories. ISS-Phyto gives a fairly precise assessment of anthropogenic pressures on marine and transitional ecosystems that cause organic loading or nutrient enrichment. ISS-Phyto describes various pressure-impact relationships, which are mechanistically decoded in accordance with metabolic theory from the resource availability responses of phytoplankton guilds to anthropogenic pressures. where CLi = ith size class; ωi = sensitivity value assigned to the ith size class, i = descriptor of size classes, from class 1 to 6; si = correction factor on number of different species found; bi = correction factor on chl a value. The ISS Phytoplankton Tool is developed by the LifeWatch Italy partners from the Universita del Salento.